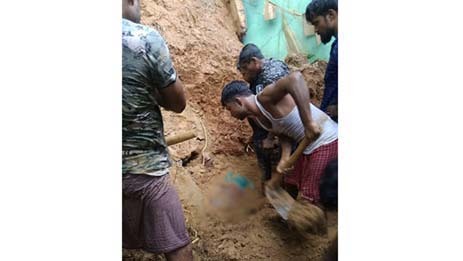 A traffic police constable, identified as 40-year-old Nazrul Islam, posted at Diphu, was buried in an incident of landslide while he was asleep at his rented accommodation and died here in the wee hours on Monday. The landslide occurred at around 2.15 am on Monday in Rongmirdan village under Diphu Police Station in Karbi Anglong district. There were heavy rains at the time of the landslide. The police were immediately informed by the villagers and a police team from Diphu Police Station reached the spot in the morning on Monday. With the help of locals, the police were able to dug out the body of the deceased, Islam. District Magistrate Junmoni Sonowal and Additional Deputy Commissioner (ADC) Norsing Bey also visited the place of the incident. Later in the day, the body was taken to Diphu Civil Hospital for conducting autopsy. The deceased, Islam, hailed from Sonari village under Dhing Police Station of Nagaon district. He has left behind his wife and children. This is the second incident of death due to landslide in Diphu within a month.